There’s something really interesting about Hearst. Where else would a town of 6000 have so many bars, the “northern ballet”, and yet still have four or five churches? 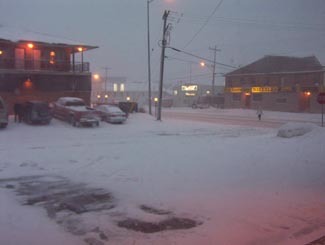 The tourist office in Hearst. So awesome. I once applied for a government job in Hearst, but never got an interview. To be fair, I realize now that I was woefully underqualified. I swear that the ad had listed French as “an asset”. Well, no French isn’t an asset – in Hearst, it’s a requirement. 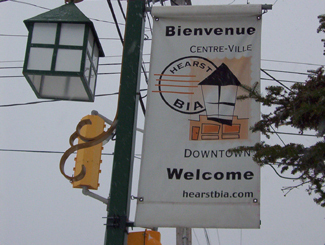 One of the most interesting things about Hearst, however, is that it is the most francophone community in Ontario – something like 85-90 percent. Hearst even has residents that only speak French, and no English. Rue George is the downtown drag and it’s really cute, with small shops, a library, a diner, and a movie theatre showing French-language movies. It’s reminds me of Penetanguishene, but more with more French. Trust me. When it’s not getting snowbombed, Hearst’s downtown is super cute. The problem is that it gets hammered all the time. Heck, I’ve been to Hearst three times. Most of the photos here are from the first time that I hadn’t been snowed in (because it was August.) Both other times, I was stuck for three days in storms even that locals found nasty. 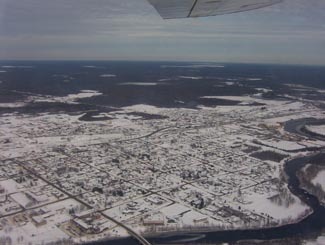 Set on the Mattawishkwia River, Hearst is a forestry town (hence the massive woodpile.) 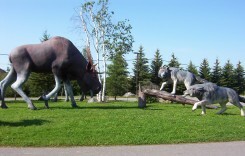 It also has a tourism industry set around hunting, outfitters, and its proximity to three Provincial Parks: Fushimi Lake, Missinaibi and Nagagamisis. It is also the end of the Algoma Line, which runs fall colours rail tours from Sault Ste. Marie to Hearst. Despite its francophone heritage, Hearst was once the site of a Slovak settlement. 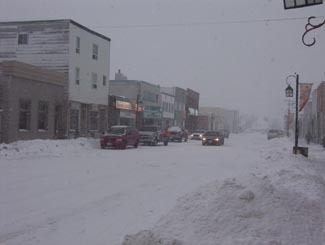 Bradlo, nestled 11 kilometres south of Hearst, the community persisted until the 1950s when the residents realized that the land was agriculturally marginal, and wouldn’t support farming in a modern economy. Therefore, Hearst has an abundance of services. It has the only McDonald’s and Tim Horton’s that you’ll see until Thunder Bay. In addition to the 24-hour garage and towing company that is advertised throughout northern Ontario, there are shops downtown and food everywhere. Hearst also has an overabundance of places that serve Northern Ontario Chinese Food. There are motels aplenty in Hearst so you should have no trouble finding a place to stay. (A note to those staying at the Queens Motel, keep your kids away from the funny channels at the end of the TV dial there!) There is also hockey in the winter – in fact, Hearst is the hometown of Claude Giroux, Philadelphia Flyers superstar, as well as Pierre LeBrun, a hockey commentator who has appearanced on TSN, ESPN, and Hockey Night in Canada. Hearst is home to the local team les Elans de Hearst. And, there is bowling. Come on, it’s northern Ontario. Of course there is bowling! 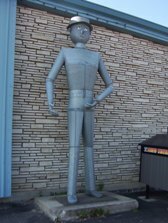 This entry was posted in The Interior and tagged amenities, big weird things, festivals, forestry, francophone, hockey, immigrant colony, outfitting, woodpile by Highway11.ca Editor. Bookmark the permalink. My mom;s family built the original Waverly Hotel. She use to share stories of her childhood, the convent, school and how they built the hotel. My grandfather (Robert Sharp) was with the OPP and stationed there for several years. My mom’s name was Dorothy W. Sharp. Would love to get in touch with anyone with any information that would help me fill in many of her childhood years. Her brother, Joe Sharp married another resident of Hearst, Rose Trombly (not sure of the spelling) They lived not far from the hotel in a home that had a corner to corner glassed in front porch. In 1945 me and my two brothers were sent to the Hearst Convent. My mother was a camp cook for Fontaine Lumber which was once owned by her father and then her nephew. 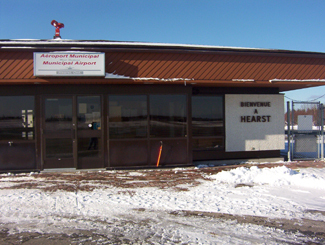 My memory of Hearst a few years later, was a town with many bootleggers patronized with lumber jacks and aboriginals. There was one theater, one bank, school and a church, one Chinese restaurant and many hotel bars. One of my brothers and I went to visit Hearst last summer for sentimental reasons. We were so amazed at the progress of the town, a University,a museum, a Welcome Center, etc. I am proud of Hearst to day. I am looking for some information of a friend from my mother. His name is John Wilfred Leonard Johnston. Does anybody know him? I was born in a small community named Jogues south of Hearst on the Algoma Railway and move to Mosher where my dad worked for the Newago Timber Company. Move to Hearst when I stared high school in 1963 and left in 1969 for College. I visit Hearst once a year in the summer to see my mom and visit with family. Just wanted to add that Hearst does have a great curling club and over the years have had many a great bonspiels in the new and old club! I was born and raised 14 miles west of Hearst(Fushimi Lake Lodge). Worked as an RPN at the Notre Dame Hospital, then went into Ambulance, then Paramedic. 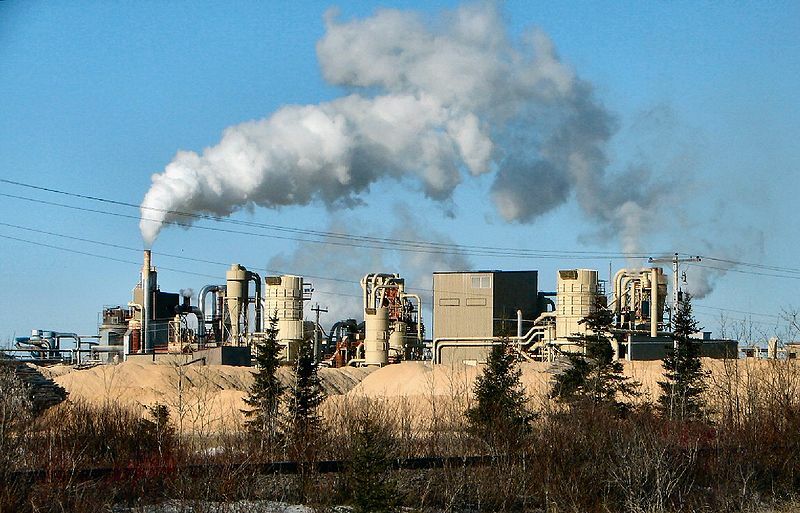 Left Hearst in 1976 to work in several different areas before settling down in Mattawa. Now we spend our winters in Florida. Both my boys were born there but they left before they five and have never been back. My husband and myself both raised in Hearst and are very proud of this little but so friendly town! Hearst sera toujours notre Hometown ! Encore ma soeur et mon frere qui habitent la et sont aussi fiers de leur petite ville ! any updates on older inquiries? My dad’s cousin was police chief in Hearst in 1929. His name was Eugene Desgroseilliers. Would appreciate any info or pictures anyone may have of him. Oui, j’ai vecu a Hearst une grande partie de ma vie. J’ai eu beaucoup de plaisir dans les diverses activites sportives, soit le ballon-balai, la balle molle ou le ” ball hockey”. Durant les annes 1970 et 1980, il y avait beaucoup de danses et d’activites interessantes. Il ne faut pas oublier le College universaitaire, maintenant l’Universite de Hearst qui est une institution importante pour la petite localite. Bravo a tous ces gens qui ont faconne l’identite unique de ce ptit coin de pays. Allô, je suis également née à Hearst, originalement de Hallébourg. J’ai déménagé dans le sud en 1985 où c’est majoritairement anglophone. Je peux vous dire que Hearst met resté collé dans la peau! Je suis tellement fière de parler de ma ville et de mon origine franco-ontarienne lorsque j’en ai l’occasion. Et comment j’apprécie avoir grandit avec des gens sympathiques. Hearst va toujours faire partie de moi. Merci! Hey Eddie, your mom and I were friends. 2 Maureens. lol… In fact we lived in your house! When my son Mark was born we were in your house. Good memories for me there. How is Bridgette? Hope all is well with you. I live on Vancouver Island now, but still have family in Hearst! I was born in Hearst and spent the first of my 15 years there, even though I wasn’t a hockey I got together with friends and played street hockey. I have fond of attending the only engish public school, I made some relly good friends who I still miss. I return as often as my disability allows me. 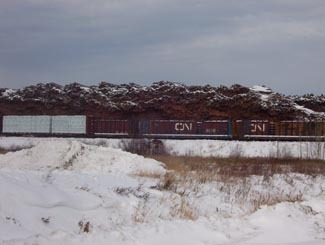 - to correct / inform you on those few last pictures; the wood pile is for a lumber mill, tembec. That pile has actually 4 piles of tree lenght logs corded treetop to treetop.. and thats just the main yard. They have 2 very large side yards.. they make lumber of various lenghts and sizes. As for that chipard photo. That is the Columbia forest products mill. They make plywood and presswood. Talk about a 6000 habitant town running on forestry! I lived in Hearst when I was 13 to 16 years old roughly and it was by some of my best years growing up…Playing hockey, and in elementary school, I made some really good friends that i am still in touch with today at 30 years old…we played golf and tennis every single day of the summer and hockey all winter steadely with so much fun. I had a group of friends and some girlfriends that I built great memories with that have a big place in my heart till this day. Believe it or not have a fond little story that I share with people today which is when I was about 15 years old living there tthis 11 year old kid or so would always be running around the block and doing pushups and had a great little name for himself already in the little sircle of hockey talk in town, and I vividly remember seimg him run around my block and ,he was kinda small and skinny but a little muscular and in obviouse good shape,and he lived a few blocks from where I lived ..and I approached him once as he stopped running near my house and I told him I think its amazing the work ethic he has and that if he keeps it up! He’ll probly make it to the NHL..the kid was cloud giroux. I’ll never forget that, and now he’s the captain of philly and a superstar and I got to witness and say that to a kid from my old block that actually did it and exCeed what I thought he could achieve from watching him work so hard from a young age.amazing, so anyway ,I had to move from there because of my fathers job (Canadian tire owner) …and I cried so much and I’ve never missed a town and the ppl there more than anything else in my life…Hearst has a big place in my Heart. Great story! I lived in Long lac for a few years and lived it there as well. Thx for sharing your story! Hearst may be somewhat isolated but most who have lived there have fond memories. We were posted there twice for a total of 4 years. Our children made great friends, played lots of hockey. We also made great friends. With hockey, curling and much socializing, winters passed quickly. We were there however in the “frontier days”. There was no McDonalds or Tims, only a local pizza shop and the only places to shop were a People’s and Home Hardware. We will always remember the mesmerizing northern lights that would fill the sky on some very cold winter nights. My father was an OPP officer who was posted to Hearst in 1980. We lived there for a total of 4yrs. I met some great people there and was lucky enough to meet up again with a couple of them about 10yrs later. I remember the cold winters -60 now that is chilly but loving the outdoors it was all just part of the experience. I have not been back since but have nothing but good memories of my short years there, perhaps I will get an opportunity to visit again. Wow, ma petite ville fait jaser beaucoup de gens, majoritairement en bien et quelques fois en moins bien. En ce qui me concerne, je suis née à Hearst en 1959 et y demeure toujours. J’adore ma ville natale pour sa tranquilité, son air pure, la nature et la faune qui l’entourent et les gens de la place. C’est certain qu’il peut y manquer un peu d’action pour une personne qui cherche des emotions fortes à tous les jours, mais on peut s’adonner à des activités sportives, culturelles et récréatives régulièrement et ce dans ma langue maternelle. And oh.. I do speak English too. Je suis fière d’être Hearstéenne. It was great growing up in Hearst. Our volleyball and basketball team won a lot. Our skating precision team won bronze medal. Thank you to the Calweart familly that invested a lot of their time in figure skating. The wife of a chyro tought us gymnastic (sorry I don t remember her name). Hunting, fishing, camping was part of our hobbies. I don t miss hearing the snow cracking under my feet when I was walking to shcool. Do you have a sister Lorena? Celine je suis certaine que j’etaus best friend avec ta soeur? Probablement dans les annee 76. Est-ce tu vivans sur le coin?